Marcon International, Inc. of Coupeville, Wa. reported that the sales of the two U.S. flag mini-cruise ships Wilderness Discoverer (ex- Mayan Prince) and Wilderness Adventurer (ex- Spirit of Adventure, Caribbean Prince) have concluded. Both vessels were sold by creditors JPMorgan Chase to private Pacific Northwest interests for Alaskan operations to begin in May 2011. The vessels will be operated under a new small ship adventure brand called InnerSea Discoveries, which is designed to be more adventuresome and appealing to a broad spectrum of younger-minded and experiential travelers. The vessels were bought back by Washington Mutual, Inc. (WaMu) at U.S. Marshal's Sale held in Seattle in May 2006 after Glacier Bay Cruise Lines filed for bankruptcy. After a number of failed attempts to sell, they were inherited by JPMorgan Chase during the takeover of WaMu in September 2008. The boats were laid-up in fresh water in Seattle, Wa. at the time of sale where they are expected to remain during their refitting. Both vessels were built by Blount Marine of Warren, R.I. Wilderness Discoverer is a 170 ft by 38 ft vessel built in 1992, capable of carrying 84 passengers in 38 air conditioned and renovated en-suite cabins on four decks. She is powered by a pair of Cummins KTA19M diesels developing a total of 1,000BHP and fitted with a bow thruster. 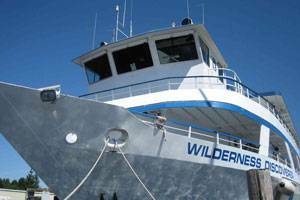 Wilderness Adventurer is a 156 ft by 38 ft vessel, built in 1983 and extensively rebuilt and repowered in 1999/2000 with GM DDC Series 60 diesels at high cost after a 1999 grounding in Glacier Bay National Park. She accommodates 69 overnight passengers in 38 air conditioned cabins with en-suite bathrooms and showers on three decks. Both vessels are fitted with a full service galley, dining room, lounge and bar. Purchase of both vessels was accepted in late March 2009, but due to a number of issues in providing clear title, the closing of the sale was delayed until now. Wilderness Adventurer was purchased for $201,240 and Wilderness Discoverer for $314,760. Marcon International acted as sole and exclusive broker in the sale and had previously sold the 31 passenger Wilderness Explorer shortly after the 2006 U.S. Marshal's Sale. So far, Marcon International Inc. has sold or chartered 24 vessels and barges during 2009. 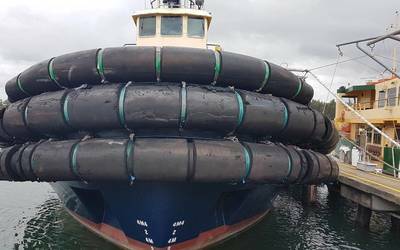 Approximately a dozen more vessels and barges worldwide are currently under offer.